This bikini is bright, fun and full of straps! The butterfly strap top ties at the neck, hooks in the back and slides on the sides for a perfect fit. The bottom is simple but flattering and unique! It will shape your curves to make you look fantastic. Yes, we do have sizing information! Like it or Not, Share it on Facebook! Free to subscribe to Bella Petite! Bella Petite Clothing ORANGE Flip Skirt! 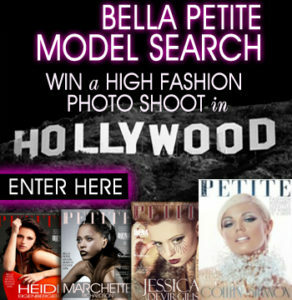 BELLA PETITE MAGAZINE: Enter the Bella Petite Model Search and WIN an all expense paid photo shoot in Hollywood and high fashion spread! Plus, a winner goes to the Ujena Jam in October 2014! Join Bella Petite today and be part of the petite fashion and model movement. Bella Petite Magazine is Fashion, Entertainment and Lifestyle for Women 5’5″ Tall & under. “Petite is fit and full figured. Free to subscribe ! BELLA PETITE MAGAZINE Enter the Bella Petite Model Search. Petite models you can get discovered here on Bella Petite Magazine like current cover model Jamie Robertson!